Home|Car Accidents, Motor Vehicle Accidents, Personal Injury, Preventing Car Accidents|Is Your Car Ready for the Next Snowfall? Traction Law (Code 15) – Based on certain weather conditions, the Colorado Department of Transportation (CDOT) will implement the provisions of the Traction Law, which provides that motorists must have either snow tires, tires with a mud/snow designation, or a four-wheel/all-wheel drive vehicle. All of your tires should have no less than one-eighth inch tread to ensure they can safely navigate a snow-packed roadway. Passenger Vehicle Chain Law (Code 16) – During severe winter storms, CDOT will implement this Vehicle Chain Law, which is the final safety measure before a highway is closed. Under this Law, every vehicle on the roadway is required to have chains or an alternative traction device, such as AutoSock. AutoSock, a textile tire cover that increases traction on icy and snowy roads, is easy and quick to mount and remove (when compared to traditional metal snow chains). Failing to comply with the Traction Law or Chain Law when in effect can result in fines of at least $130. If a motorist blocks the roadway because (s)he has inadequate equipment when a Passenger Vehicle Traction Law or Chain Law is in effect, (s)he could be fined more than $650. This does not include the costs and liability that can arise if the driver causes a car accident. 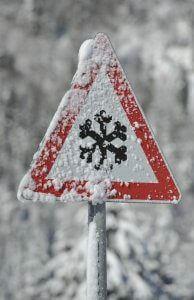 Make sure that you are ready for winter driving by knowing the law and properly preparing your vehicle. Of course, accidents can still happen even with the best preparation. If you find yourself injured in a motor vehicle collision through no fault of your own, contact an experienced Denver car accident lawyer at Bell & Pollock, P.C.